Marketing and Advertising genius, Sheeraz Hasan, known for successfully creating huge social media amplification for Fortune 100 companies through celebrity endorsements and social media influencers, has announced the launch of his latest venture on a .TECH domain. Aptly named HOLLYWOOD.TECH, the business aims to be a bridge between Hollywood celebs, social influencers and technology companies for brand endorsements. Sheeraz Hasan is an entrepreneur, social media expert and internationally acclaimed real-time amplification and media strategist who has overseen campaigns for some of the most recognized brands, celebrities and government agencies in the world. He has a direct network to social media influencers that reach over 3 billion people across all social media networks. Hasan also manages marketing campaigns and works directly with a number of world-famous celebrities including Kim Kardashian, Justin Bieber, Selena Gomez, Priyanka Chopra, Zendaya and the Jackson family, among others, generating over $2 bn in earned media. 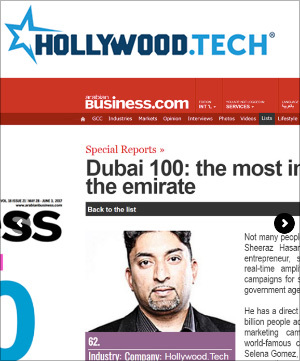 He is one of the Top 100 Most Influential People in Dubai, as per ArabianBusiness.com. While his other venture, Sheeraz.Inc works with brands across sectors, HOLLYWOOD.TECH will focus only on tech companies looking to amplify their brand through celebrity endorsements on social media. This is Sheeraz Hasan's 5th venture and he has chosen to launch it on a .TECH domain. Speaking about the choice of the name, HOLLYWOOD.TECH, Hasan said, "What is better than www.hollywood.tech as the name for a website that brings together two vastly successful giants of our modern world: Hollywood and Technology! The name is concise yet descriptive, and just perfect for my business debut in the tech sector." Talking about this association, Suman Das, Brand Manager, .TECH Domains, said, "We are thrilled to have successful entrepreneur Sheeraz Hasan use www.hollywood.tech for his venture. As technology makes its way into each and every sector, .TECH is fast becoming the choicest domain name for brands looking for a short, memorable and meaningful name that instantly creates an impact." .TECH, operated by Radix and launched two years ago, has seen a large scale adoption by the tech industry (www.ces.tech, www.cta.tech, www.tnw.tech, www.viacom.tech), social media influencers (www.edgar.tech, www.dom.tech, www.andru.tech), SEO experts (www.seo-hero.tech, the global winner of WIX SEO Hero challenge) and tech startups (www.dadi.tech, an open source content management company). With www.hollywood.tech, the domain has now made a foray into the media and marketing industry in a big way. Local Time: Saturday, April 20, 2019 03:20 PM PDT – Page Load: 0.2928 Sec.